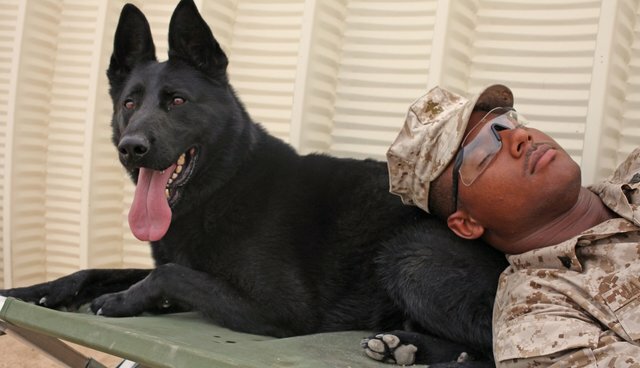 Until 2000, military working dogs (MWDs) were discarded, warehoused or euthanized at the end of their service. There was no law allowing for their adoption and retirement. However, that changed when President Clinton signed a bill, known as "Robby's Law," to facilitate the adoption of retired MWDs. Since that time, countless families and retired dogs have been united, but there is still much more to do. While retired military dogs are now available for adoption, some fail to enter the system simply because of their location overseas. It makes sense for the military to take responsibility by bringing MWDs back to the US at the completion of their tour, but they're not. Retired MWDs are reclassified as "surplus equipment" and discarded if there is no immediate home. We worked with the top D.C. lobbyist from Animal Welfare Institute to end horse slaughter in 2011. A couple of years ago, we worked with him on the Canine Members of the Armed Forces Act, sponsored by Representative Walter Jones, Jr. (R-NC), in the House, and Senator Richard Blumenthal (D-CT) in the Senate. That would have done several important things, including requiring the military to return MWDs to the US upon completion of their service overseas, so they could enter the adoption program at Texas' Lackland Air Force Base. While the Canine Members of the Armed Forces Act was blocked in 2013, President Obama signed the National Defense Authorization Act into law, which authorized - but doesn't require, as originally intended - the secretaries of the various military services to transfer the dogs back to Lackland Air Force Base or another location for adoption. This provision would be for any MWD who is to be retired and for whom "no suitable adoption is available at the military facility where the dog is located." This kind of language is needed to ensure that the military returns MWDs to the U.S. where homes are available. The bill also authorizes, (but again, does not require), the Secretary of Defense to create a program with funds from the public to provide veterinary care to retired MWDs. While these steps are important, they fall far short of ensuring that the US military upholds its duty to honor these national canine heroes by requiring them to return them safely to the US, and caring for them as they age. Several basic tasks that the US government should do for every single veteran, no matter how many legs and/or tails they might have. #K9VeteransDay is today, Mar. 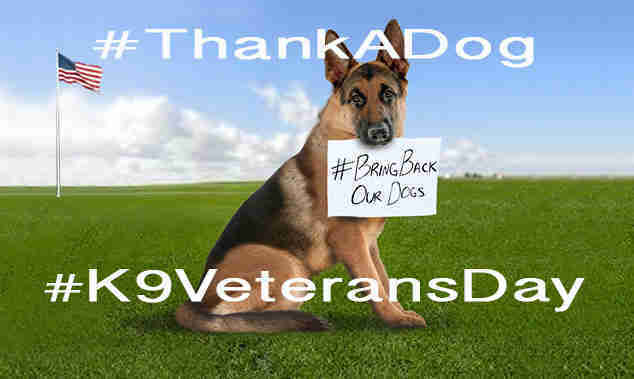 13, so let's make our canine veterans lucky and "leave no man or dog behind." Demand that our representatives #BringHomeOurDogs from overseas. They fought for us, just like all our veteran heroes did.